Questions and answers of "Two Long-term Problems: Too Many People, Too Few Trees". Answer: Most living Nobel Prize winners are clearly worried about the present state of the biosphere ( जीवजगत ). Human activities have badly damaged our natural environment and critical resources. If current practices continue, the situation will worsen to the extent when no remedy would work. However, the scientists are still hopeful that the world will soon realize the gravity ( गम्भीरता ) of the situation and do utmost to protect and improve the health of the natural world. Answer: The world's population is growing at an alarmingly fast rate. There are the problems such as desertification, flooding, landslides, soil erosion, droughts and weather extremes, depletion ( नाश ) of non renewable sources, acid rain, extinction of living species, ozone layer depletion and greenhouse effect. Thus the root cause of many natural disasters and worsening quality of life is deforestation which again is the direct result of overpopulation. Secondly, our lakes, rivers, air, soil and drinking water and even space are getting polluted increasingly. Millions of people fall victims to the diseases caused by human made population. Thus Professor Nissani is right in attributing most of the world's ills to over population. Answer: Extensive deforestation will severely disturb the balance in the weather. Very little rainfall will quicken the process of deforestation. With no trees, rain water will carry the topsoil and deposit it into riverbeds, dams and lakes. In turn, this siltation ( नदी ताल वालुवाले पुरिने कार्य ) will cause devastating floods in the plains of Nepal, India and even Bangaladesh. With the fertile ( उपजाउ ) topsoil gone, our land will not produce food for us. Answer: After having read Nissani's essay, now I can teach my village people the value of trees and forests. I can now make them aware of the immediate and long-term and consequences of deforestation. I can also persuade my friends, and relations and villagers not to cut down tree unless he/she has instead planted and nurtured another one of the former's size. In addition, I would also persuade them to use the more efficient and smokeless cooking stoves instead of the firewood. It will save trees. I would also need to convince them that most of the natural calamities such as floods, landslides and droughts are singly caused by deforestation. This awareness will make them use forest products sustainably ( लामो समय सम्म धान्न सकिने गरी ). Question No. 1: Discuss the problem of over population and deforestation Nissani deals with. 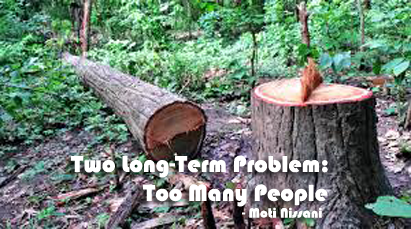 Answer: Nissani deals with twin problems: overpopulation and deforestation. The latter is the consequence of the former. After the industrial revolution, due to advances in nutrition ( पोषण ), sanitation ( सरसफाई ) and health, people live longer, and thus population has started growing rapidly. Every year eighty million people are added. In Nepal, in 1951, the population was nine million. After less than fifty years, the number reached twenty three million. Population growth causes environmental problems. Air, water and food get polluted which will lead to the extinction of the lives of many species of birds, animals and planets. Moreover, in order to feed huge population, forests have to be cleared. Due to uncontrolled population growth crime, and conflicts increase. It causes pollution as well. The problems can be solved if population is controlled. The population can be controlled through modernization, literacy, media campaigns ( संचार अभियान ) easily available contraceptives ( गर्भनिरोधको साधन ) and equal opportunities for women. Deforestation is pressing a problem. The destruction ( विनाश ) of forests result in floods, landslides, and soil erosion. As the pollution increases, we face the problem of ozone depletion ( ओजोनतहको क्षयीकरण ), greenhouse effect ( हरितग्रह प्रभाव ) and acid rain ( अम्ल वर्षा ). This problem can be solved by controlling the population through effective family planning, education and equality in opportunity. Reforestation will have bio-diversity, pure wilderness, and it will minimize desertification, flooding and declines in rainfall. Greater efficiency in the use of wood products and massive tree planting can be other possible remedies. The search of alternative fuel is also essential to solve the problem. Lastly, we need strong determination to put this knowledge into practices. Class 12 Course "Two Long-Term Problem: Too Many People, Too Few Trees"
Question Answers Of "Two Long-Term Problem: Too Many People, Too Few Trees"
Complete Solution Of "Two Long-Term Problem: Too Many People, Too Few Trees"
0 Response to "Two Long-Term Problem: Too Many People, Too Few Trees | Question-Answers"